There are 3 hamstring muscles. 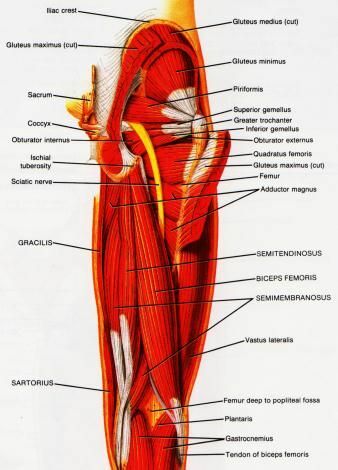 They are the biceps femoris, semitendinosus, and semimembranosus. The hamstrings are the muscles on the back of the thigh, and they work to move and stabilize the hip and the knee. At the hip, they all pull the hip backwards into extension, and at the knee they bend the knee. The hamstrings work during walking, running, and jumping. They work especially hard during sprinting, and generally hamstring strains occur when someone is running as fast as they can. The hamstrings are often divided into the medial (inside) and lateral (outside) hamstrings. The semitendinosus and the semimembranosus run down towards the tibia which is the bone on the inside of the lower leg; whereas, the biceps femoris runs down to the fibula, which is the bone on the outside of the lower leg. All 3 hamstrings start on the bottom of the pelvis. There are many different ways to work your hamstrings. The hamstrings work during multi-joint leg exercises like squats, lunges, the leg press, and dead lifts, and there are machines that also work the hamstrings. Click here for pictures and instructions for the best hamstring exercises.